Excellent software app gainings from the most asked for in download webs sites! Use the popular utilities types, learn the latest releases of the great tools, and download forthwith! Do not lose an opportunity to acquire the best apps: apply SoftEmpire to acquire software package for free of charge. See the directory of free programs and app releases. take among Windows services programs, test controllers, playgames, and all other types of programms for your computer or mobile gadgets! 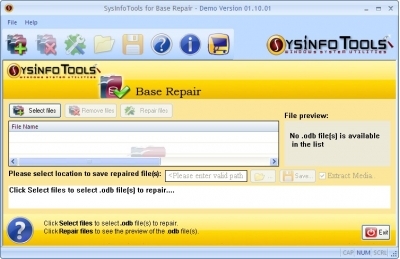 SysInfoTools Base Repair is a powerful repair/recovery tool which successfully restore content from a severly damaged ODB file. And save recovered files to the user defined location.